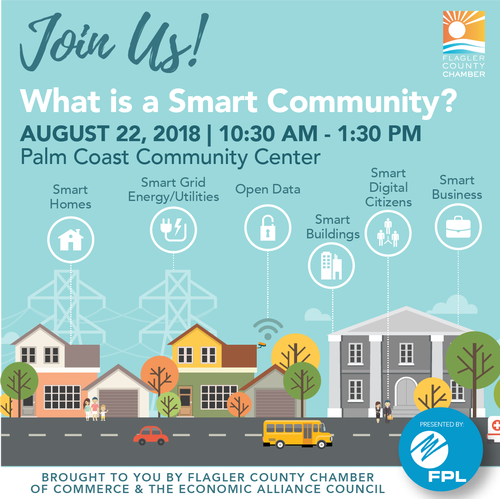 Brought to you by the Flagler County Chamber of Commerce & the Chamber's Economic Alliance Council, the "Smart Community Luncheon" will be an educational event aimed at showcasing components that make up a smart community. Learn about the technology movement that is shaping our community for the future. From transporation and utility systems to innovations in our business community, hear what our local civic, business and community leaders are implementing to make Flagler County a Smart Community. The event will be lead with a keynote presentation by Jeff Sheffield, Executive Director for the North Florida Transporation Planning Organization about Smart City technologies. A smart city is an urban area that uses different types of electronic data collection sensors to supply information which is used to manage assets and resources efﬁciently. This includes data collected from citizens, devices, and assets that is processed and analyzed to monitor and manage trafﬁc and transportation systems, power plants, water supply networks, waste management, law enforce-ment, information systems, schools, libraries, hospitals, and other community services. The smart city concept integrates information and communication technology (ICT), and various physical devices connected to the network (the Internet of things or IoT) to optimize the efﬁciency of city operations and services and connect to citizens. Smart city technology allows city ofﬁcials to interact directly with both community and city infrastructure and to monitor what is happening in the city and how the city is evolving. Followed by a working lunch where Innovative Sponsors will have a few minutes each to present how their businesses are working to be SMART. Moderator: Helga van Eckert, executive director for the Flagler County Department of Economic Opportunity. Sponsorship opportunities are available. For more information, contact Robbin Wilson or click to review options.